Deltiology is one of the world’s largest collecting hobbies, rivaling only coin and stamp collecting. Deltiology is the official name for collecting postcards. Postcards cover so many topics that almost anyone can find a subject to get interested in. History, art, holidays, cars, military, famous people, buildings, sports, and animals are just a small sampling of the topics you will find portrayed on postcards. 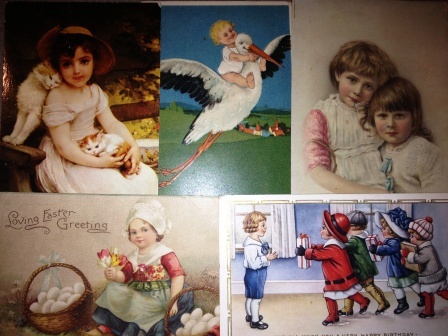 My personal collection consists mostly of postcards with children as the subject. Postcards have been printed on many different materials, including leather, metal, wood, plastic, linens and even fine silk. Some were made from actual photographs while others were hand painted or hand- made. The earliest postcards date back to the 1870’s. Postcards can be categorized into five different types; View Cards, Greeting Cards, Historical Cards, Art Cards and Photographic Cards. View cards give a historical reference to buildings, towns, streets, bridges, etc. It was common for people to collected cards from the places they traveled to as well as from their own home towns. Greeting cards included holidays such as Christmas and Easter as well as other special occasions like birthdays, anniversaries, and new arrivals. Historical cards are printed to remember events such as war, politics, social problems, disasters, parades and expositions. This type of card was often made from authentic photographs. Art cards covered special interest subjects so much fewer were produced and they generally demanded higher prices. During the early 1900’s, postcards were so popular that the market drew in some of the best artist of that period. A German publisher, during the same period, produced a series of “Old Master” art reproductions. The quality of the artists and the printing processes produced some of the most amazing mini master pieces to be collected today. Photographic cards were, as the name suggest, made from real photographs. Sometimes the photo cards were hand tinted in great detail with stunning colors producing some of the most beautiful cards produced. I love collecting postcards because I can keep so much beauty in such a small space. Looking through my postcard album filled with cheerful little children always makes me smile. To begin or add to your postcard collection shop at the Albany Antique Mall on 2nd and Ellsworth St. in historic downtown Albany. Open Daily.